The easy way to set up large cable reels for dereeling. The DE300 utilizes the help of leverage to enable one person to easily set-up cable reels weighing up to 1000 lbs. (454.5 Kg). Two people can set-up reels over 2000 lbs. (909 Kg) in weight. The dereeler is stable and will not tip as cable is dereeled. 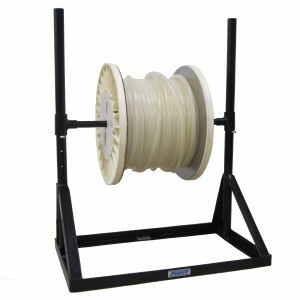 The height of the cable reel is easily adjusted with two pins.